Bacillus thuringiensis (known as 'Bt') is an insecticidal bacterium, marketed worldwide for control of many important plant pests - mainly caterpillars of the Lepidoptera (butterflies and moths) but also for control of mosquito larvae, and simuliid blackflies that vector river blindness in Africa. Bacillus thuringiensis is considered safe to humans and non-target species, such as wildlife. Some formulations can be used on essentially all food crops. Bt is, actually, susceptible to degradation by sunlight. Most formulations persist on foliage less than a week following application. Unlike most garden insecticides, Bacillus thuringiensis is a highly selective poison. It is effective only against the caterpillars listed and should be used only on the crops on which they feed. Spraying or dusting plants with spores of this bacterium appear to be environmentally safe ways to attack such pests as the gypsy moth, the tent caterpillar, and the tobacco hornworm (which also attacks tomatoes). 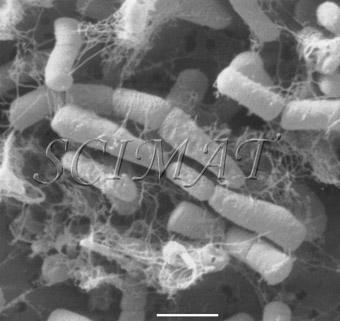 When the conditions for bacterial growth are not optimal Bacillus thuringiensis, like many bacteria, forms spores. Spores are the dormant stage of the bacterial life cycle. 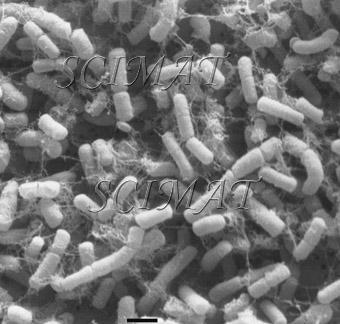 Unlike many other bacteria, when Bacillus thuringiensis creates spores, it also creates protein crystals [shown above in blue by TEM (left) and by SEM (right)] - and they constitute the toxic component. After an insect ingests such a bacterium, the crystal is dissolved in the insect's alkaline gut. The mechanism of the insect's demise involving the action of a delta-endotoxin is explained in detail. Various Bacillus thuringiensis crystal proteins have a special nomenclature. Bacterial culture purchased from WARD'S. The micrograhs are protected by copyright. 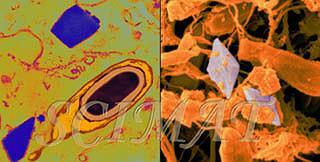 For technical and scientific information about the images featured please contact the author. Commercial interest in micrographs should be directed to CMSP, PR, VU, MS or other stock photo companies.